A multivitamin is a preparation intended to be a dietary supplement with vitamins, dietary minerals, and other nutritional elements. Such preparations are available in the form of tablets, capsules, pastilles, powders, liquids, and injectable formulations. The most important thing to understand with any supplement is what it contains and why you might want that substance. 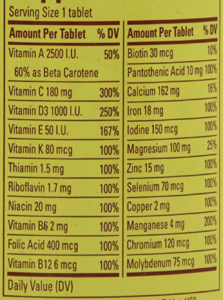 Below is the label from a Nature Made multivitamin bottle. All of these nutrients are important, but most of them are found in our diet and are absorbed better that way. So, a supplement may contain a large amount of a vitamin or mineral, but not all of it will be absorbed. Why are vitamins and minerals necessary? Vitamins and minerals are coenzymes and cofactors that serve important biochemical roles throughout the body. For example, vitamin B6 is vital for multiple chemical reactions that take place in the liver. Enzymes decrease the amount of energy required for a chemical reaction to take place. The human body contains a large number of enzymes, and some require an additional specific molecule to work (sort of like a car key). These molecules are coenzymes and cofactors. Vitamin and mineral supplements are not necessary in healthy individuals. The body takes what it needs and gets rid of the excess during absorption. This is a natural mechanism to prevent toxicity. Some vitamins, such as vitamin B12 have stores within the body that can last years. This is not to say that supplements have no place in the medical world. In disease states, such as osteoporosis, supplementation can be very beneficial. Particularly vitamin D in the case of osteoporosis. Despite multiple studies assessing the effects of vitamin supplementation on heart disease, cancer, cognition, and many other topics, no significant differences in the groups receiving supplementation and the control groups have been found. Are there side effects from Multivitamins? 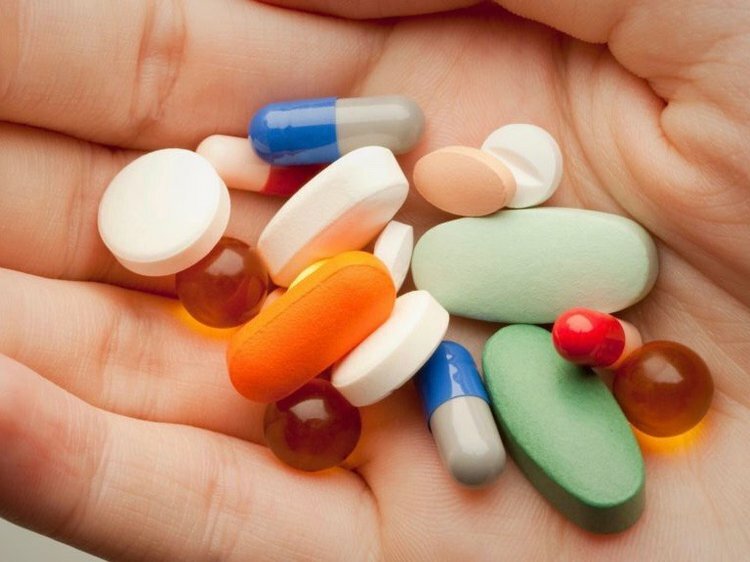 There is very little risk to healthy individuals that choose to take a multivitamin. There is also something to be said about the placebo effect. Perhaps the belief that the multivitamin is helping you may allow you to feel better. The mind is very powerful. I am sure I am not alone in thinking I immediately feel a little better right after I take ibuprofen for a headache, even though I know that it takes longer for the medication to start working. The USPSTF conclusively recommends against vitamin A and E supplementation because of the potential deleterious effects. Multiple vitamins have negative effects in high dosages, but the risk and impact of A and E excess is greater. Vitamin A excess leads to blurred vision, bone pain, hair loss, and various other side effects. 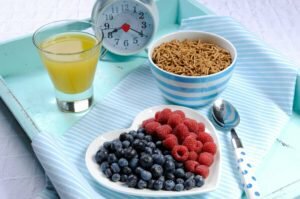 Vitamin E excess has been shown to increase the risk of heart disease. Always check with your health care provider before beginning any medication, over the counter or otherwise. Over the counter items can still interact with prescription medications to produce harmful interactions. No scientific evidence exists showing a clear benefit to healthy individuals taking a multivitamin. Thus, it is more beneficial to save your money or use it to buy some delicious nutrient rich foods. It is also important to consider the financial aspect of vitamins. The supplement industry makes over a billion dollars every year selling many products with very little, if any, scientific evidence backing up their bold claims. Additionally, these products are not always cheap. Nature Made’s multivitamin is on the low end at $6.59 for 130 tablets, while other brands can be over $20 per bottle for just one month’s supply. This is not going to break the bank, but it is an unnecessary expense, especially given the lack of a proven benefit. Do you take vitamins daily? What has your experience been? Please share your thoughts and experiences in the comments, on social media, and anywhere you prefer. In future posts I will highlight each of these vitamins and minerals in more detail. Have a great day and be well. This content originally appeared on Dr. Beyer’s personal site: Force of Well. Force of Well is a website dedicated to empowering individuals and promoting wellness through blogging, podcasting, videos, and social media. Check them out at https://forceofwell.com and on iTunes: (podcast link).